JT Day Pty Ltd offers a comprehensive selection of handheld torches, flashlights, hand lamps and lanterns from Wolf Safety Lamp Company for hazardous area inspection work. The Ex certified work torches and lamps can be used with primary cells or rechargeable batteries. Sourced from Wolf Safety Lamp Company, the portable lighting products range includes mini and micro primary cell torches in ideal pocket size options. The mid-size Wolf Midi torch produces 6500 lux @ 1m making them ideal for close quarter inspection work. Safety torches featuring straight or right angle lights are available in primary cell or rechargeable options. Head torches allowing for hands-free inspection are supplied with helmet clips for hard hat use. 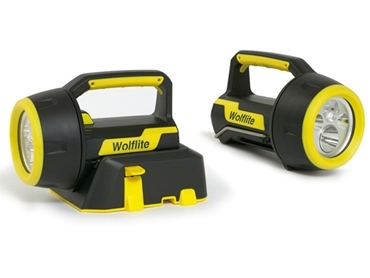 Wolf’s premium range of high powered hand lamps includes the Wolflite, the XT LED rechargeable hand lamp designed to deliver a substantial spot beam of 13130 lux at 1m or delivering 260 lux at 1m in the floodlight mode. All Wolf handheld lighting products feature IEC Ex approvals suitable for Zone 1 and 2 applications, and are designed with robust IP67 protection in a lightweight package.